Click the link to view the Top 100 List. Building a destination that people want to spend time at is the mission of American Plant, a 95-year old garden center in its third generation of family ownership. Marketing Manager Gina DeMatteis explains how a focus on organic gardening, community-centric events and strong giftware offerings allows American Plant to capture its metropolitan clientele and keep them coming back. Garden Center: What do you want customers to get from a visit to American Plant? Gina DeMatteis: We say that a trip to American Plant should be an experience, not just an errand you have to run. Our locations offer a piece of tranquility and excitement all wrapped up in one visit. We really have everything you need for your home, indoors and out. You can get your garden supplies, your annuals, your perennials, trees and shrubs. Our lifestyle boutique is a great gift destination, and then we have greenhouses that have top-of-the-line orchids and houseplants, and we do custom arrangements. So, the only thing we don’t do is fresh flowers, like floral design. GC: What can you tell me about American Plant’s other offerings? GD: We do have a design center at one location, where [our] landscaping [department] has an office. It’s a house on the property where the designers created an outdoor living space, so it’s a showcase for customers when they come to meet with the designers. There’s a formal patio with a fireplace, a casual in-ground firepit, a succulent garden, and a little bonsai area, so it’s a nice example of what our landscape designers can do for the customer. GC: I understand that American Plant is also known for being a fully organic store. How did that come about? GD: We took the lead [on the organic movement] in 2000. We went organic because the boys who are the generation running [the business] now — the three brothers — their mom was diagnosed with lymphoma. So, we pulled all of the toxic chemicals off the shelves and went organic, which was pretty controversial back then. But, we stuck to it and of course now ... people are really appreciating that. Our signature topsoil and pine soil is organic. We’re very conscious about the environment. GC: Another thing American Plant is known for is the home-brewed compost tea, which is advertised on your website. Could you extrapolate on that? GD: We brew it on weekends, it restores and increases the populations of beneficial microorganisms. It improves the nutritional quality of plants, the soil structure, water infiltration, oxygen diffusion and water retention. It retains nitrogen and trace minerals through chelation. It makes nutrients bio-available at the times and rates that the plants require. It produces hormones that help plants grow and stay healthy. So, it’s really just feeding your soil to make it the best energy that the plants can absorb. You have to use it within four to six hours of brewing it, so it’s fresh and strong. You can put it on your grass, too. There are millions of live, beneficial organisms in it that help your grass and the environment and soil. We’ll brew a certain amount and then bottle it. It’s perishable, like any natural herbal product. The potency won’t last long. You need to use it within a certain amount of hours. It says ‘[use within] four to six hours of brewing,’ and to apply it as soon as you get home. To get the most out of each holiday, American Plant redesigns its “lifestyle boutiques” around fall and Christmas seasonal themes. GC: I know events for holidays and other special occasions are popular at American Plant. What would you say are the biggest ones? GD: We do a lot of seasonal things for the community. Our staff creates a haunted house at each location. So, we have a lot of creative people on board who want to create these things and really excite our customers, which is fun. We’ll do a movie night for the kids — they bring their sleeping bags and we make popcorn and cider. But, we’re right in town, so you can just pop over at night, buy your pumpkins, watch a movie and go through the haunted house — you don’t have to drive an hour away. We do the same thing over the holidays; it’s free to come and talk to Santa Claus, get your picture taken with him. We try to create that warmth with people. We give a lot of donations to the auctions and the local high schools, because a lot of our seasonal staff are students. [At Christmas], we [sell] the six-foot Frasier Fir that’s absolutely beautiful, and we do it at a really competitive price. People just love it because you can stop, do the Santa visit, get your tree, buy your gifts, you can have custom arrangements made. We have a wreath counter in both stores [during] the holidays, where you can pick your base wreath and then we’ll make custom bows for you and add to it. You can add little ornaments, and we have all the accouterments for the wreathes, so we’re kind of famous for that around the holidays. We just started doing new events in the past year and a half. We’ve been doing after-hours events, like [making] succulent arrangements, terrariums and fall containers. We did an herb event, and the annuals manager we have at one location’s brother is a chef. He came and did a little talk on how you can muddle herbs in your cooking and drinks, and he actually made a sampling that customers could try. We got a great response from the events so we’re continuing to do that. GC: How has this year been so far? Were there any challenges this spring? GD: It was a late spring. We thought [the weather] was going to be [a problem], but people got so anxious that when they came in, they came in full-force. They came in again and again. Our parking lots were just jamming in both locations as soon as we got that little taste of spring/summer. Right now, it’s been a little bit of a quiet time, but that’s just because August is the big vacation month. It’s also a good time for us to breathe and start getting ready for fall. Right now, we’re starting to recreate the lifestyle boutique toward fall, and get ready for the pumpkins, and the haunted houses are already in production. We need that little bit of downtime and really, this is the only time of year that we get it. People were still coming in late summer, getting hanging baskets and things because, I think, they were so anxious to create their gardens and embellish their front porches with color and containers. Then we had that rain spell where, if you had annuals planted in your containers, they just got drenched. That actually worked in our benefit, because everyone came back to replenish after the rains, so we’ve been stocked all summer. GC: Any final thoughts on what you think helps American Plant stand out in the industry? GD: We’ve thought about the needs for urban people who have balconies — our garden supplies have these great containers for growing herbs that involve easy watering and filtering, and we have little greenhouses to grow herbs [indoors]. We’re trying to cover everybody’s lifestyle needs, whether you live in a big house or in a studio apartment. Inspirational settings like this help customers imagine how the products would look in their spaces. In a region known for premier tourism and cutting-edge retail, Molbak’s Garden + Home goes beyond holding its own. 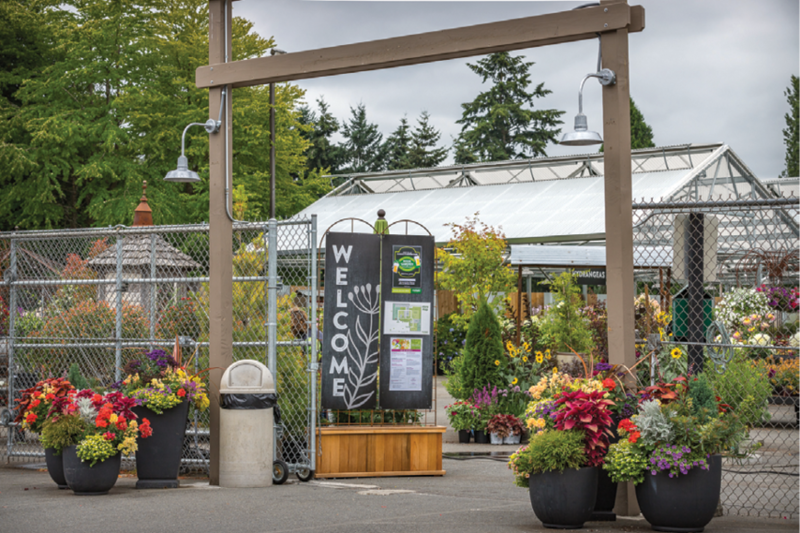 With more than six decades rooted in Washington’s wine country, just a 30-minute drive from downtown Seattle, the Woodinville, Wash., independent garden center is redefining the garden, home and gift experience. By virtue of size alone, Molbak’s garners preferred destination status. The 17-acre property’s live goods area covers 56,000-plus square feet. Add the 8,010-square-foot Garden Store and Home + Gift’s nearly 17,000 square feet, and chances are they have what you need. But Molbak’s is known for more than size and selection. When customers walk in either of the store’s main entrances, Store Manager for Hard Goods Susan Burchak expects two reactions to Molbak’s elaborate displays: surprise and delight. This year, the Garden entrance transformed into a “garden theater” with an ever-changing selection of peak plants, from spring edibles to prime perennials, while the Home + Gift entrance celebrates the excitement of each new season with lifestyle selections. The full impact of Molbak’s comes courtesy of a staff that’s passionate about the products, but also about working at the IGC. Buyers use several sources, including social media, to find out which plants are trending. Live Goods staff reports that indoor plants, particularly succulents, are still rising strongly. In hard goods, not surprisingly, the houseplant craze feeds increased container sales. “Our indoor containers are so popular,” Burchak says. “It goes with that trend of indoor. People are really wanting to bring those elements inside and decorate with them. Indoor containers have just been growing along with indoor plants.” Macramé hangers have staged a comeback along with other accessories. Other strong areas include accents and pollinator plants. “Our accents have been a really big thing for us this spring, for people really wanting to add that special touch to their garden,” Burchak says. Popular items include spinning garden wheels, giant faces and rustic farm animal décor. Burchak has also noticed continued interest in pollinator plants. “Customers have really been talking about the eco-systems, and people have been hearing that in the world in general, so pollinators are doing really well,” Burchak says. The Wedge, a store-within-a-store concept, combines different products from throughout Molbak’s in one place. With a store this size, reactions such as, “Gosh, it’s so large,” or “I didn’t know you had this” aren’t unexpected. But the Molbak’s team turned this potential disadvantage into opportunity with store tours that started earlier this year. Well-received by customers and staff, the 45-minute tours take people through the store — no behind-the-scenes peeks included — highlighting the product range and sharing bits of Molbak’s history. “We also find that people coming in with out-of-town guests or family that don’t live close by really enjoy that special touch,” Burchak says. Associates talk with customers about the tours, and overhead announcements signal their start. Associates conducting the tours also carry signs so other shoppers know what’s happening and feel free to join in. Groups typically comprise about 10 people. Staying competitive and cutting-edge in the fast-growing, fast-changing Pacific Northwest demands reaching a new generation of gardeners and continuing to reach and inspire an existing generation. She also sees social media as a key component in staying in step with change. “You have to keep up-to-date on social media, because that’s one way [customers] like to connect.” She points to the prevalence of airiums, terrariums, and succulents on Pinterest and other social platforms. “Keep up socially on what’s going on out there,” she says. The IGC responds to emerging trends with lifestyle and educational options, from the on-site garden café and wine bar to educational seminars on topics such as food preservation techniques, including trendy fermentation and dehydration. Trying to categorize Molbak’s as either “garden” or “home” ignores their innovative melding of the two. A new concept store within the store, just opened in mid-August, exemplifies their success. Great signage and displays are found throughout Molbak’s departments, from live goods to home and gift. The Wedge offers indoor décor, indoor containers, succulents, low-light plants, candles, gifts and more. “We’ve done a lot of color schemes in there. It’s pretty simple. It’s very modern, and it seems to be attracting all generations. With this latest example of how Molbak’s pushes the envelope, Burchak notes that inspiration is all around — if you just step out far enough and look. White Oak updated and expanded its greenhouse space last year, adding facilities with panels that open and close with changing weather. In 1979, six years before White Oak Gardens CFO Evan Webeler was born, his father, Jeff, bought a small Cincinnati, Ohio, rose business. Webeler grew up in the industry, earned an economics degree and gained banking experience — but his sights were always set on the family-run independent garden center. Garden Center: Your website invites people to “Come get the full experience.” Tell us about it. Evan Webeler: We’re a full-service garden center with a brand-new greenhouse facility as of last year. We almost quadrupled the size of our covered greenhouses … to over 12,000 square feet, now paved and under automated roof panels that open and close with weather conditions. We make sure to take care of each and every customer with our knowledgeable staff, which includes 12 Ohio Certified Nursery Technicians. We’re known for creating remarkable displays, including our straw bale designs and VW (Volkswagen) Bug, which we repaint multiple times each year. We talk a lot about improving our customers’ quality of life through plants. We stay current on plant pests and design issues with Ohio State University Extension and keep ahead of customers’ problems. GC: What inspired you to stay in the industry and work at White Oak Gardens? EW: I knew I always wanted to work in the business. I’ve been proud of what my parents built over the years with their long-tenured staff, and I’ve always looked up to the employees that worked here since I was little. It is very much a family-oriented culture. I bring a financial background to the business. My father always said, “I can teach you all the horticulture you need to know, and you can teach me the business end of things.” I love working with my own family. My brother Andrew and my mother, Patty, work in the landscape division, White Oak Environmentals. My wife, Renee, works in the greenhouse, and I get to be in the same office as my father. GC: What are White Oak’s greatest challenges? EW: Developing business practices to manage and develope our employees as we continue to grow our sales and our staff. Also, continuing to constantly deliver a “wow” experience to our customers to increase customer count in a retail environment where everyone is predicting the downfall of brick-and-mortar retail locations. Lucky for us, we are a glass-and-outdoor retail establishment that connects people with nature. GC: What has been your greatest success to date? EW: Seeing the rebuild project come to fruition and how excited the community and the staff is to be in the new environment. Working with [consultants and peers in the industry] has given us many of our ideas and helped us implement pricing structures to ensure we are making money. It’s amazing how much we as an industry instinctually fear raising prices and how little customers really take notice. Without some of the pricing changes we made, which directly reflected on our bottom line, we would not have gotten approved for financing for our $1.1 million rebuild/expansion of our greenhouses. GC: What categories are most popular at White Oak Gardens? EW: Important categories for us are, in order, annuals, shrubs, perennials, mulch, hardgoods and tropicals. Our annuals category has been the backbone of our growth and profitability, comprising almost 25 percent of our yearly sales. The largest growth has come in tropicals, pottery and outdoor living. We’ve focused on increasing our selection of houseplants and succulents and trying to recreate the beautifully styled pictures that are all over Instagram, Pinterest and Facebook. The results have been quite noticeable in our financial statements. GC: What do IGCs need to do to stay relevant and reach consumers? EW: Constantly be innovators and know how to get the word out about how awesome their place is. Focus on building a consistent brand that reflects well with consumers. The store’s Volkswagen is painted multiple times a year and is a hit with customers. GC: What advice for do you have for other IGCs? EW: Don’t be afraid to take risks. Learn to communicate effectively with your family who work in the business and your staff, which all starts with being able to listen. We’re going through a University of Cincinnati Goering Center course (through the Lindner College of Business) on how to successfully transition your business. That has opened our eyes to how much family, including employees, are hesitant to discuss important business matters. Not until we all take the chance to invite others to share their thoughts, and actively listen to what they have to say, will we be able to make the right decisions for the overall health of the business.